In  Father Salví qualified his tale right before the telling: "you should not forget the one that is the most beautiful because it is the truest." The tale that follows is a moral, doctrine in an entertaining form, one that seeks to encourage converts. Perhaps too, it is meant to warn against disbelief, intimidate disbelievers. In , the reproter Ben Zayb replies at once: "Marvellous, what a marvellous tale!" He hobnobs and—in his special manner—he kowtows. This being the routine for which we have long identified him. However, Rizal makes more of this character than a mere yes-man. Ben Zayb flatters but does not kneel. He seems to be keeping himself from doing so only because the priests already have parishioners in good supply, continually kept ignorant. No. What he offers the priests the decorous fawning of the educated, perhaps the genteel (the type of attention they have been steadily losing as knowledge and civilization progresses in the West). The scientific too, as evidenced by Ben Zayb's words: "Very suitable for an article! Description of the monster, the Chinaman's terror, the waters of the river, the canefields. And then again, it lends itself to a comparative study of religions. You will observe that the heathen Chinaman in the moment of his great danger invoked, of all people, a saint whom he knew of only by hearsay and in whom he did not believe. The saying that the devil we know is better than the saint we don't, obviously did not apply in this case. For myself, if I were to find myself in such a danger in China, I fear I would call upon the least known saint in the calendar before calling upon Confucius or Buddha. Whether this argues toward the logical inconsistency of the yellow race can be elucidated only after profound anthropological investigation." In , Simoun subtly shoves Ben Zayb's rhetorical curlicues aside with his version of the Socratic mode: "two questions you should raise in your articles. First: what the devil can have happened to the Devil when he suddenly found himself encased in stone? Did he escape? Did he stay there? was he crushed? And second: can the fossils I have seen in the museums in Europe possibly be the victims of some antediluvian saint?" Simoun plays deuce against deuce. He takes it to the realm of the museums and dinosaurs (empiricism, science) and hides a challenge in chronology (could St. Nicholas be that old?). However, this degree of sophistication was lost on the priests, at least on Fr. Camorra, whose only reply was a grave "Who knows?" The jeweler fails (here, and at the close of the book) because his designs needed to be symmetrical ("what the devil can have happened to the Devil..."). Simoun demanded that his revolution be intricate (the hologram of Egypt, the meticulous crystal of his bomb), justice ought to be poetic for it to be justice. He had been this way even as Ibarra, so perhaps no one can say that it was the loss of Maria Clara that necessitated a revenge of commensurate beauty. I sign off from these notes tonight. Someday, I might again touch upon the slime of these green scales. And if not these Fili specimens, remember: another cayman lies in wait, submerged—partially—in the Noli Me Tangere. José Rizal. El Filibusterismo. Trans. 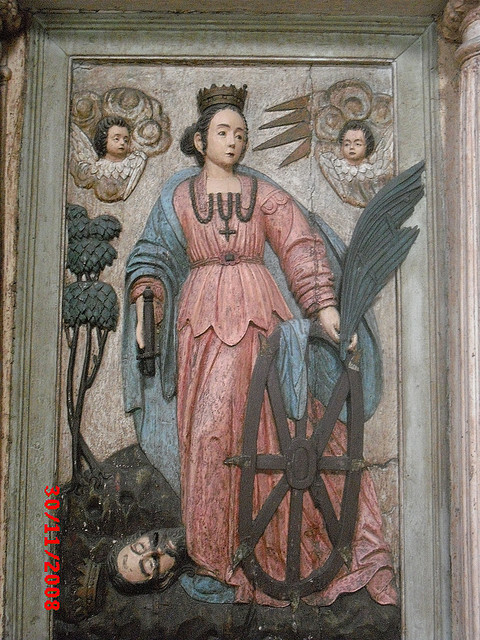 by Leon Maria Guerrero. Quezon City: Guerrero Pub., 1996: 21. 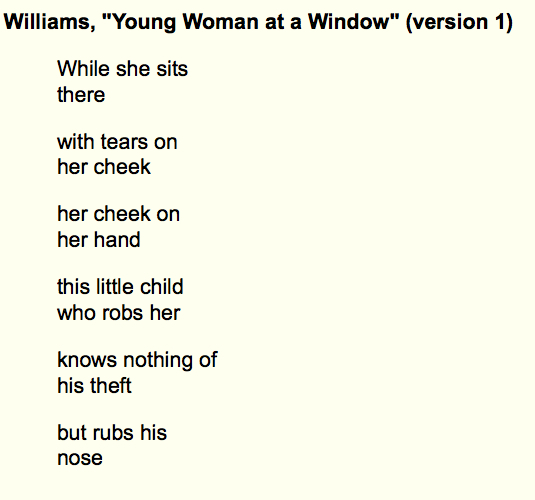 THE FOURTH PANE: Observations on "Young Woman at a Window"
Williams's second version of this poem provides a solid example of imagism, of poetry aspiring to the impact and clarity of sculpture. It is "more imagist" than the first: a better cadence has been fleshed out, a superior condensation of sounds presented. Common words have been arranged in 1 to 3-syllable lines and paired into 4 to 5-syllable couplets. We observe no punctuation marks and find only "She", the first word, capitalized (more tangible than the "While" of version 1). The poem sounds like one sentence, but it's been cut near-evenly into five successive aspects of a single scene, a still of two people. This truncated, unpunctuated arrangement departs from traditional forms such as sonnets and ballads. It maintains a lack of embellishment, adjectival description, sentimentality, even narrative and characterization, or at least the old manner of telling stories through lyric. In lieu of all these, we receive fresh cadence, meaningful enjambment, a view of five panes, a new logic of lineation. From these givens, we can derive the image. The first couplet sets the scene and also establishes a presence (the capital S "She") as well as an absence after "with". Later, we learn that a child is with her, but this dangling "with" suspends his presence with a blank space. Come the next line, "tears" take over, again, with an absence of cause after "on". The second couplet is a pair of cheeks, perhaps the woman's. 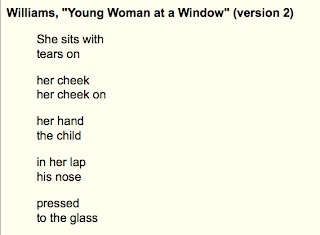 The couplet shows her being doubled by the child or the reflection on the window (this window crystallizes less effectively in version #1). Like the second, the third couplet is composed of two halves of different, adjacent clauses (like a face halved by the pane and within that pane, joined to another half). 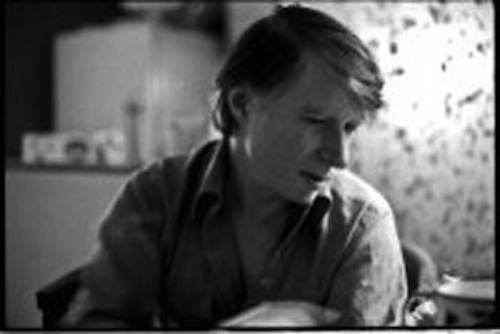 The reader's eye moving from cheek to hand. 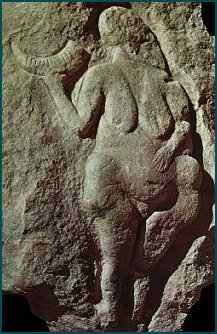 Also, the hand "becomes" the child, or perhaps his claims on the "hand" of the woman, his provider and protector. Likewise, this juxtaposition could mean the child as a physical and psychic extension of the mother. The pairing in the fourth couplet is interesting, how "her lap" engages "his nose", how "his nose" could be blocking "her lap" from other possibilities, or how this unity gives the woman her singular consolation (I find "in her lap/his nose" a more definite, concrete alternative to "his theft" in version #1). The fifth couplet closes the scene: the woman cries, the child looks out the window. The window offers the child a view of other scenes, things, possibilities, but it blocks "his nose". It locks him in with her, both "pressed/to the glass" for our observation, for Williams's composition. 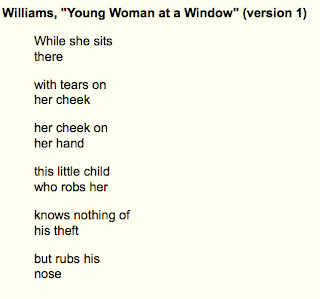 Exactly like the poem, the transparent, semi-reflective surface of the window shows spliced, superimposed images and reflections, multiplying the scene with a great thrift of images (She, tears, cheeks, hand, child, nose, glass). Through this, we are free to read hopes, causes, relationships, and pain from the generous blank spaces that are also of the poem. I think that a certain mode of interaction with divinity is at work in this poem. Glück’s “Vespers” takes me to some parables, in particular those where a landlord leaves the land to his tenant and returns after a time to call them to account. The Parable of the Talents is perhaps the most famous, but there are others. The persona here sounds like a tenant, but one who recognizes the landlord for the divinity he symbolically is (one who could “withhold// heavy rains”). I am interested in the diction, especially in the words found at the outset, such as “anticipating,” “return on investment,” and “principally,” all of which where ripped right out of a business management textbook. Because of these words, by the time we arrive at the addressee’s “heart” and the persona’s “doubt” regarding his understanding of it, “that term” takes on another meaning (or understanding) as a period in the venture, or a phase (“twelve weeks of summer”). That’s in business, but it glides (too smoothly, perhaps) into parable where the “term” is the span of time that the lord allotted to the tenant in order to work the land and, in the process, to prove the worth of the earth as well as of the self. “That term” has another layer for me: metapoetry. Here we return to the place (or figure, as in this poem) where the word “term,” like other words, could be taken in all its multivalence to bear fruit, become “heart”. In fact, we can make a case of the addressee here as poetry itself, as that which withdraws inspiration (in your absence) so that the poet is forcefully abandoned to work the earth. 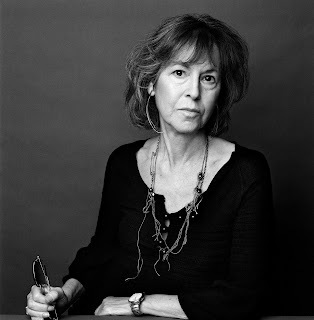 While doing so, she believes in a return, a second coming which is desired, of course, but also dreaded, because she will be called into account (the Vespers, the evening prayers, the closing of the day), and she fears coming to poetry empty-handed, especially as that would mean that all she has done was waste “that term”: earth, time, and precious life, the span of her heart (perhaps also not only her life, but the lives of those she “grows” such as tomatoes, relationships, children). "Vines" here is a particularly cruel word. In parable, that means grapes, and wine, and crushing. But the vines also are entangling, like flaws in verse, or wrong life-choices. And there must be a sense of power here, for the persona, when she takes responsibility for that which provides life as well as chokes it out of us. “Verse” shares the same etymological root as words like reverse, converse, and inverse and traditionally same sense of the “turn” (These turns are ascribed to the rows of farms, the furrows, which are seen as correlates of the lines in a poem. Aside from formal turns, a poem is usually expected to make a turn in narrative or rhetorical turns. A sonnet takes this turn or swerve usually after the 8th line. Shakespeare takes it further than Petrarch by introducing the couplet, which some read as a further turn, or at least an introduction of a nuance of the turn. It follows rhetorical ends, because you must first show the persuasee that you know his or her mind before you take him or her turn to your point of view). Anyway, what I wanted to say is that the farming language commingles metapoetry, business, and parable quite naturally because of its place at the root of civilization, that which gives rise and perhaps makes necessary the forms of commerce, religion, and literature we know today. God, poetry? Perhaps death is what’s immune to foreshadowing? This a puzzle in the poem for me. I can’t take vines as a purely beneficent, life-giving image. Maybe because weeds also come in the form of vines. The god of wine, Dionysus, uses vines to collapse buildings, ships. It can be viewed as an entropic symbol, or if that’s too exaggerated, at least a symbol of the earth taking back (in) the constructs of man, as well as man’s own corporeal form. I suppose that the persona’s claiming responsibility over her constructs, her verses, even her life. But the way it sounds to me, she seems likewise staking a claim upon her own death, or at least its form: how she has decreed her decline to proceed entwined with her the fortunes of her verse. Early on, I wanted to know the implications of using tomatoes, and this reading fits! It’s a weekly, almost daily thing, so much so that you could lose that all that color (we love it in every one of its stages, from green to red, and all the minglings of yellow and orange in between) and succulence if you don’t pay good attention, the type of attention an artist would give. Of course also, a poet like Glück. It’s not a special occasion fruit, or something so otherworldly as the pomegranate, it’s almost unsymbolic because of its dailiness (almost). What fun to see your poetry (vocation?) in the image and likeness of a tomato. In my previous annotation, I left a question hanging regarding Fr. Salví's legend of the Chinaman, St. Nicholas, and the giant crocodile: What are the implications of turning the devil itself into stone? Tilde made much headway into this question in the mother of crocodiles, a take that includes an overview of things-thus-far in this exchange as well as a lizard's eye view of the electoral results. In . 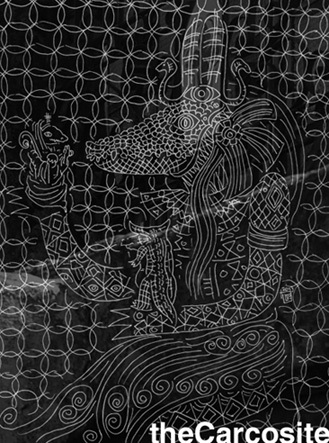 Tilde used the image of Sobek, an Egyptian god who, along with the expected might and ferocity, possesses also the attributes of a creator god and a collector of things lost or abandoned upon the Nile. Since Sobek's visage guides this annotation, I now aim to temper the view of the croc. We remember how Fr. Salví thought it a menace of the highest order, saw it as the devil incarnate. In his story, at least two religions converge upon the Pasig river: Fr. Salví's catholicism and the Chinaman's unspecified heathen faith. In his encounter with evil, the Chinaman was "inspired by God" to call on St. Nicholas. In . Perhaps we have two incursions: a foreign man upon the local river, and in the mind of this man, a foreign god. There is symmetry if we assume that catholicism is native to the river, God's voice and the Devil's reptile thus come as opposite (but complementary) functions of the same conversion process: positive and negative reinforcement. However, what if there are three cultures at play here? The Chinese and the Spanish are both players but the silenced native is merely terrain, perhaps a prize. Another possibility: what if the crocodile is the unconverted native, the wild and disobedient? Maybe we are dealing with a muted native divinity, one re-purposed by the dominant power as an emblem of terror. Maybe the crocodile is not pure fable, perhaps we are looking at banditry here, the fearsome who prey upon river folk, who likely keep a keen eye on lightly guarded merchants and priests. Or these feared are the river folk themselves, Fr. Salví's story thus an assertion of power in order to submerge a great insecurity: what if they rise from the water to take what belongs to them? If so, then Fr. Salví's crocodile is a demonization of the native. If so, then it is the effective inverse of Old Selo's crocodile ("Make believe you lost the thirty pesos gambling, or that you dropped them in the river and a crocodile swallowed them." In ) where the animal is a naturalization of the foreign evil. José Rizal. El Filibusterismo. Trans. by Leon Maria Guerrero. Quezon City: Guerrero Pub., 1996: 21-22. It seems that once upon a time the river, like the lake, was infested with crocodiles so huge and voracious that they attacked boats, overturning them with a blow of the tail. Our chronicles record that one day a heathen Chinese, who had up to then refused to be converted, was going down the river past St. Nicholas Church when suddenly the devil appeared before him in the shape of a crocodile and overturned his boat to devour him and take him to Hell. Inspired by God at this crucial moment the Chinese called for help to St. Nicholas and immediately the crocodile was turned to stone. The old-timers say that in their day it was possible to recognize the monster in the fragments of stone that still remained of it; I myself can say that I was able to make out the head of the reptile and judging from it the monster must have been enormous! In . Fr. Salví's narrative legitimizes its storyteller's general claim to ascendancy as priest of the land as well as an individual among other powerholders mingling on the upper deck of the steamship Tabo . By means of his story, we discover that his claim is (at least) two-fold: the miraculous and the rational. An effective miracle must contain both the ineffable and the intelligible, which brings us to the second claim. For Fr. Salví's power arises also from factual evidence, from the explicable: the stones along the river resemble the broken pieces of the devil-made-manifest. In this case, miracles are not counterfactual, rather they are assumed to be the basis of the factual. Beyond the stones as mere proofs of the miracle, we are to accept each stone as manifestations of the miraculous-in-the-world. This is why Fr. Salví inserts himself as eyewitness ("I myself can say that I was able to make out the head of the reptile"), the recipient of the transcendent power is in the best position to perceive it. Let us entertain two possibilities: (a) recipient therefore perceiver, or (b) perceiver therefore recipient. In (a), the vocation and position endowed him with the means to perceive the demonic (crocodile) in the every day (stones). In (b), it is the narrative transmission of the proofs of power (legend, 1st and 2nd readings) that generate the power (priesthood, authority recognized by folk who transform themselves into parishioners). An important question for later: What are the implications of turning the devil itself into stone? On the upper deck of the steamship Tabo, Fr. Sibyla, Fr. Salví, Fr. Camora, Fr. Irene, Don Custodio, Ben Zayb the journalist, Simoun the jeweler, and the skipper began exchanging legends . Simoun prompted the storytelling. He was covering his tracks. He was distracting the others from the issue of his short absence without revealing his interactions on the lower deck. He effected airs of boredom: 'I have seen so many rivers and so many landscapes that now I am interested only in those that have some legend connected with them' . They had been traversing the Pasig River, the place Fr. Salví believed he had successfully destroyed his rival, Crisostomo Ibarra. This recalls that hunt which closed the pages of Noli Me Tangere. Let us look at "Chapter 3: Legends" as itself a hunt that would culminate in the memory of the hunt for Ibarra thirteen years ago. However, this is a leisurely hunt, one of those scenes where a prince gathers his allies, their men and hounds, brings them to the heart of the wounds, and there he releases a fox. Hunting for sport has important functions besides entertainment and camaraderie. It is a show of trust. The prince does not merely showcase his territory, he also reveals high ground, soft spaces, hidden locations. This is a military function: they are marking the territory for the best places to defend it. The hunt is a competitive display of strength and cunning. It is also a call for intimacy—or a renewal of intimacy—with powers that the prince would rather have as allies rather than enemies. As intimacy increases, so does room for treachery. For the hunt likewise unveils vulnerabilities and blind spots: what are places that the men avoid? which of his lieutenants are weak? how much is this man willing to spend for my loyalty? The storytelling aboard steamship Tabo is exactly this. Simoun pretends to be a foreigner open to tutelage. What is this land, what are its stories? How does it account for itself? Fr. Salví in : 'I must tell it to Simoun who cannot have heard about it. It seems that once upon a time the river, like the lake, was infested with crocodiles so huge and voracious that they attacked boats, overturning them with a blow of the tail.' And so the princes answer in kind, showing off their knowledge of pagan lore only to reassert the unassailability of their doctrines. The larger the crocodile, the greater the glory of St. Nicholas. In the course of this sport however, the priests could not help but betray their disunity, the competing interests between the secular priesthood and the religious orders, among the religious orders too, and challenges are exchanged in the form of convivial banter. Although these are truly divisive (Simoun would take advantage of his increasing familiarity with this frictions), we understand that these hegemonic blocs are really only fighting over the spoils. There are no true ideological rifts, no differences in terms of principle. The crocodiles are all slinking toward the same drowning man, each desiring the greater chunk of flesh. And so in true Tilde spirit: happy election day! To each his own croc! We know as much: stories of the perfect candidate will, in a span of few days, yield to stories of who cheated who. If we squint a little, shield the eyes for a while from the dire cost of these narratives, we shall soon discover: there is much entertainment to be had. José Rizal. El Filibusterismo. Trans. 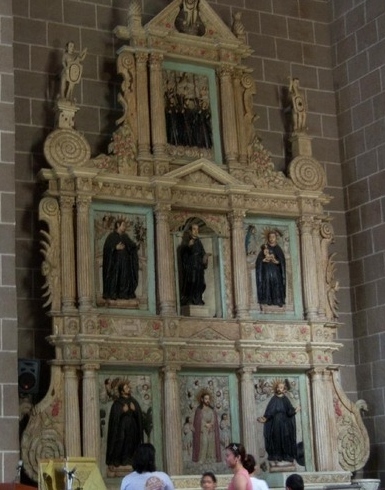 by Leon Maria Guerrero. Quezon City: Guerrero Pub., 1996: 20.
na iginugol sa paghagulgol at pag-inom. sa mga krayola at papel. ng aking pagkataong mali ang pagkakayari. at humahagulgol sa sahig tuwing ako'y aalis. Mga mata na aking mga mata. ng mga halik at mga kumot. Na ang unang agahan ay akin mismong katawan. The month of May approaches full bloom. Pollsters and fraudsters are upon us. Rain, elections, predators. Tilde wanted to discuss something in keeping with the times. Therefore, crocodiles. Originally, we wished for a follow through to the Bakunawa project, that is, our irresponsible gallivanting in the realm of folk narratives . However, Rizal finally caught up with us. Maybe it was really only a matter of time. El Filibusterismo, his novel, opens with a scene on the upper deck of the steamship Tabo as it cruises along the Pasig river on the way to Laguna. The second chapter takes us down to the lower deck. This shift sets us up for what would become the dynamic of the entire book: we begin with scenes of the high life, the Spanish elite, the priests and the attendant insulares, only to step "down" to the view below, in the company of students, tenants, the various dispossessed. This is one of the chief ways that the novel establishes it causes and effects: excesses from above result in suffering below, acquiescence or struggle from below stabilizes or destabilizes the powers above. Simoun the jeweler traverses the strata with ease by means of network and subterfuge. His acts and interactions effectively stitch the novel together (and I find this aspect of Simoun analogous to Rizal's performance as an author, in particular, how he displays then dramatizes an internal contradiction of his novel: that it was born into Spanish, into the then-foreign novel form, but that it was written it for the sake of the indios, the vast majority of whom were incapable of reading its contents). 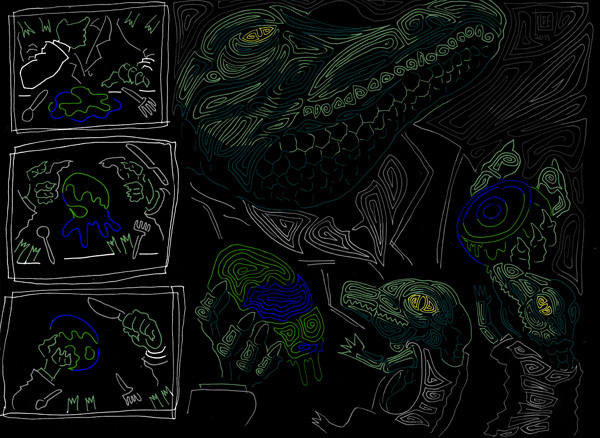 Rizal's delivery of the crocodile narratives seem to me illustrative of the aforementioned design. There are two crocodile stories, the first appears in "Chapter 3: Legends". Fr. Salví tells it to the other bosses of the land, the widely traveled, the wealthy, and most importantly, the literate: "...once upon a time the river, like the lake, was infested with crocodiles so huge and voracious that they attacked boats, overturning them with a blow of the tail. Our chronicles record that one day a heathen Chinese, who had up to then refused to be converted, was going down the river past St. Nicholas Church when suddenly the devil appeared before him in the shape of a crocodile and overturned his boat to devour him and take him to Hell. Inspired by God at this crucial moment the Chinese called for help to St. Nicholas and immediately the crocodile was turned to stone. The old-timers say that in their day it was possible to recognize the monster in the fragments of stone that still remained of it; I myself can say that I was able to make out the head of the reptile and judging from it the monster must have been enormous!'" In . 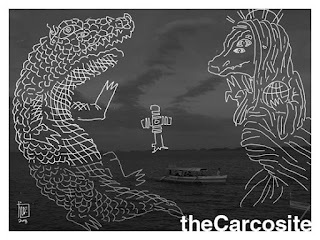 In "Chapter 4: Cabesang Tales," the crocodiles resurface between two illiterate farmers, Tales and his father Selo. Tales suffers the loss of his wife and daughter to the fever contracted while clearing a piece of land. The remaining family perseveres, but "on the eve of their first harvest, a religious order which owned lands in the neighbouring town had claimed ownership of the newly cleared fields, alleging that they were within the limits of its property, and to establish its claim immediately attempted to put up boundary markers. The administrator of the religious order's estate, however, let it be understood that out of pity he would allow Tales the enjoyment of the land for an annual rental, a mere trifle, a matter of twenty or thirty pesos." In . Rizal describes Tales as "peace-loving, "averse to litigation," and "compliant to the friars". Old Selo would reinforce his son's inclination to "give in under such pressure" by advising him in this wise: "'Patience! You will spend more in one year in court than if you pay for ten years what the white Fathers want. Oh well, maybe they'll pay you back in Masses. Make believe you lost the thirty pesos gambling, or that you dropped them in the river and a crocodile swallowed them.'" In . Let us compare Fr. Salví and Old Selo's crocodile stories. As the adversary of both stories, the crocodile presents a harmful, overwhelming, and inescapable force, one beyond the control of either the Chinaman or Cabesang Tales. Both protagonists take defensive routes, but their reactions are markedly different. The Chinaman prays to a saint he does not subscribe to, that is, one external to his belief system. On the other hand, Tales concedes his earnings to the crocodile. In his case, there are no saints, or if there are, and despite the fact that he subscribes to them, such saints are external to him in the sense that they belong to the enemy, the friars. In , Fr. Salví begins his story this way "...since we are talking about legends, you should not forget the one that is the most beautiful because it is the truest, the one that tells of the miracle wrought by St. Nicholas, the ruins of whose church you may have seen," that is, we are given to believe this as a fact. On the other hand, Old Selo repeatedly counsels his son to "make believe," but this means at least two fictions in one. First, Tales must make believe that the claims of the friars on his land are truthful. Yet, since this fiction violates his family's honest struggle and corrupts the memory of the deaths that sanctified this long work, another set of make-believes must ameliorate the cruelties of the first. So, according to this fiction, while the land still belongs to Tales, he loses a portion of the produce either to gambling (fate), or dropping in the river (accident) and its crocodiles (nature). Fate and nature co-habit the land, all the world in fact, "co-owns" it in the sense of being able to affect its progress. Perhaps Old Selo finds consolation in the fact that neither fate nor nature has the human agency to consciously direct the land's development, to truly enjoy any of the gains. However, the second fiction also wreaks violence because of the fact that a separate entity reaps what it did not sow, feeds on land for which it did not bleed. That entity is human, customarily expected to bear reason and truth. On top of this, these frauds are of the holy orders, the purported well-springs of compassion. So maybe a third fiction is possible, one that ameliorates the amelioration, justifies (and contradicts) the justification. As a fiction, it is at once the most obvious as well as the subtlest, for it restores Tales to the truth of things, grounds him there, even though he will not be able to look it in the face, not until he becomes Matanglawin. In the case of the Chinaman's crocodile, the priest is our storyteller; in the Cabesa's crocodile, the priest is itself the animal. Bakunawa begins here. Tilde's crocodile illustration sourced here. TAKING FIVES: Fragmentary record of attempts to own "Chronic Meanings"
Read or listen to Bob Perelman's "Chronic Meanings," a poem of 25 quatrains. You might also wish to read here or here for some notes regarding the process. GE— I'll take "Structure announces structure and takes" off Perelman's poem because of it's metapoetic value (not only for this particular poem, or of his own poetics, but perhaps for all poetry read and written). This line also shows me a body invaded by disease, the immune system overrun, deceived to feed on itself. And that amazing word "takes" that that keeps, that saves, takes away, takes us nowhere, takes us so many places (as this poem does, and life) only to arrive at the period. Would you share your choice? AN— "Then, having become superfluous, time." Yes indeed. Time, and therefore words. I wonder if he cut this off from somewhere? Nevertheless its perfect (to me) the way it is, placed where it is, after that cutting description of AIDS (and poetry, language) as "Symbiosis of home and prison." AN— "The sky if anything grew." A longing for the comforts of the myths? Eternal life as well as judgment? AN— "dumb/ as old medallions to the thumb" all that's left. if i had a line, that "stopped me cold" it's "Economics was not my strong." I mean, what?! Economics, now, really? And then I thought of the metapoetry, economy of the line so forth. The condensery. But also the budgeting of time that goes into the meditation of mortality. And how it's hard to find strength in that. In the counting of breaths. GE— i think (and maybe im just over thinking it) that the toaster can be a metaphor for what's going to happen to him: here we have a man living his life, doing his job, and trying to maintain his sanity in this world and then pop, (or is it Ding) here's the news that he'll die of aids. i find the directness of it to be honest and so perfect. AN— that "ding" or "pop" sounds like the period at the end of the line! AN— The 1st line you chose reminded me of Neruda's line in Preguntas which goes: "Is there anything sadder in the world than a train standing in the rain?" AN— this line resonates for me with "The phone is for someone." AN— out of our hands. and the rest of the sentences as well are out our hands whether writer or reader or addressee. AN— "The lesson we can each." has the same feel for me as your first choice, "A story familiar as a." It's yes, that the lesson (or story) doesn't get told in its entirety, if there is an entirety. Or if there's a lesson, that's all the lesson there is in the world: "The lesson we can each" "A story as familiar as a." is all stories, because they all end (as in Atwood's "Happy Endings" story). AN— this particular Atwood story is very short. I remember reading it in two anthologies, one of which is Sudden Fiction International. Here's the link to "Happy Endings"
GE— thanks for piquing my interest (once more) with that line!will have to listen in again on perelman. AN— Truly! The power and creativity of a poet's intention. I liked your take on these two lines, thanks. GE— The cutting of each line too, maybe. Something that couldn't be helped. AN— nothing left in, nothing left out, nothing left. AN— the way you put it gets me to thinking now about the way back is totally indivisible in "In a Restless World Like This Is"
AN— "There are a number of." But a number of what, right? Options, debts, friends, ideas, projects, toys in the attic, words? Whatever it is, they're not yours anymore, they're out of your sight, the world recedes. AN— There you have it, co-Anon. "Words" definitely. And in the following line. Only one. Only one word, one life, on you? GE— and maybe not enough of now either. thanks for weighing in! O sa banal na Santa Walpurga? Sa obrero, o sa mangkukulam? O patikim, sa iyong delubyo. Sinimulan ko itong tula, kamakailan, at agad inabot kay Tilde pagkatapos. Kakagaling lamang namin sa isang kolaborasyon, mainit-init pa kumbaga, at naisip ko na baka mapakinabangan namin ang isang tulang nag-uugat sa kasaysayan ng pagkakaroon ng saysay ng petsang a-uno ng Mayo, at pinauusbong ng kasalukuyang paghahanap pa rin ng kabuluhan. Maaaring mauwi uli kami sa isang kolaborasyon, naisip ko, pero solb na rin kung maging okasyon lamang ang nasabing tula para sa kaunting e-kwentuhan. Sa kabutihang palad, nakabuo si Tilde ng isang likhang lumilihis sa kanyang pangkaraniwang estilo. 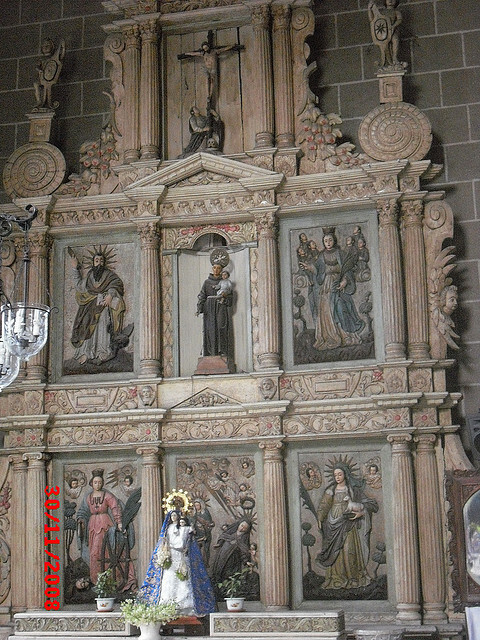 Naaalala ko pa noong unang nakita ang isang set ng tatlong retablo sa Silang, Cavite. Pinag-iisipan ko ito, ngayon, habang isinasaalang-alang itong dibuho ni Tilde. Pinag-aralan ko ang mga retablong iyon, ginawan ng papel, at ipinasa kay Prop. Quibuyen. 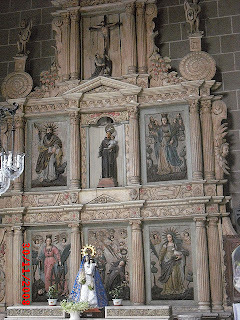 Bagamat tinalakay ko rin ang gitnang retablo (yung nasa likod mismo ng altar), mas nagpokus ako sa magkabilang retablo: kaliwa at kanan. 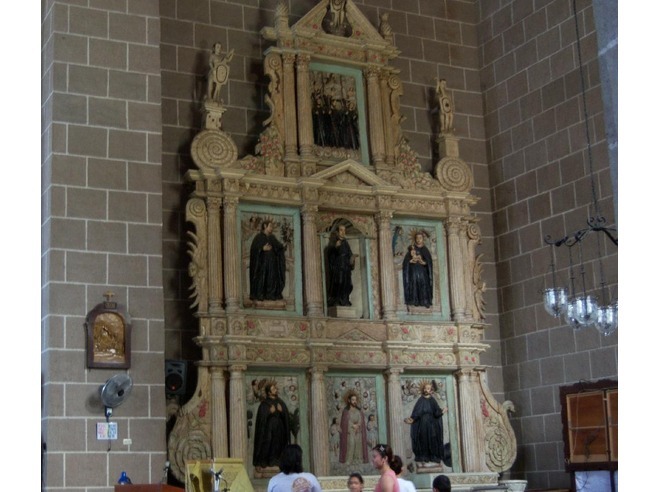 Pawang mga lalaki ang matatagpuan sa kaliwang retablo (mula sa puntodebista ng altar, kanan kung titig ng parokyano ang pagbabatayan), mga pari at obispong naging santo. Itim ang kanilang mga sotana. Si Hesus lamang ang hindi nakaitim. Nasa gitna siya ng pinakamababang antas. Madasalin ang mga pigura rito, nakikipag-usap sa mga ibon o kerubin ang ilan sa kanila. Pangkaraniwan para sa akin ang retablong ito. Sana makita ko ang kopya nung luma kong papel, kasama ang mga nakuha kong litrato noon, para maalala kung may iba pa akong namarkahang kapansin-pansin sa retablong ito. Ang pinag-isipan nang husto rito ay "bakit nasa kaliwa ng pari (ang Hesus sa altar) itong retablong lalaki?" "Retablong lalaki" ang kaliwa, sabi ko, sapagkat dominante naman ang babae sa kanang retablo. At sa kasalukuyang kaayusan, naroon ang Birheng Ina sa "kanang kamay" ng altar. Marahil hindi ito masasabing "retablong babae" kung dadaanin natin sa bilang. Marami pa ring lalaki sa larawang ito. Maaari ring basahing nagkakaroon ng kahulugan ang retablo mula sa kaugnayan ng babae sa lalaki, sapagkat sa pinakatuktok ay matatagpuan ang Ina sa Paanan ng Kristo. Sa gitna naman ng pinakamababang antas, matatagpuan ang batang Hesus bilang Kerubin o Kupido na tangan ng kanyang Ina (kasama si San Jose sa panel, at ang ilang mukha ng kerubin). Interesante ang bahaging ito dahil pinapana ng Hesu-Kupido ang isang madre. At bumaon siyempre ang palaso sa puso ng pinagpalang babae. May gumagabay (o nag-uudyok) kay Hesus sa naturang paninilo. 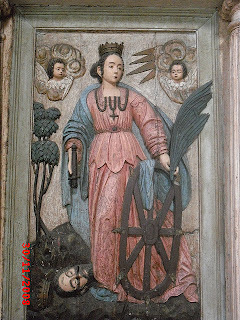 Hindi ko na maalala kung si San Jose o ang Birheng Maria mismo ang dumuro sa puso ng santa para iklaro (o iwasto) kung sino (o anong bahagi nitong sino) ang karapat-dapat madapuan ng banal na asinta ng Kristo. Paborito ko rin ang katabing panel, nasa kanan ng Hesu-Kupido, kaliwa sa puntodebista ng tumutunghay. Palabas ang karahasan nito. Wala sa "retablong lalaki" ang maitatapat sa karangyaan at kulay nitong pigura. Nakatuon ang reyna sa isang espada na tumatagos sa mukha ng isang patay na hari. Sa kasawiang palad, tanging puluhan na lamang ang makikita natin dito at wala na ang talim mismo nitong espada. Totoong bakal kaya ang ginamit para sa talim? Makikita pa ang marka kung saan dapat nahahati ng espada ang mukha. Kanang kamay na naman ang marahas. Ngunit nakatuon: nagpapahinga? Nasa kaliwa ang gulong at ang palaspas. Mga simbolo ba ang mga ito ng muling pagbuo? O ng mga nakalas, nasawi sa nakaraang kabuuan? Gulong ito ng karwahe, at kapansin-pansin ang mga tilos na umuusbong mula sa mga rayos ng gulong. Kapansin-pansin din ang halaman (katabi ng kalis) na umuusbong mula sa pinangyarihan nitong digma. 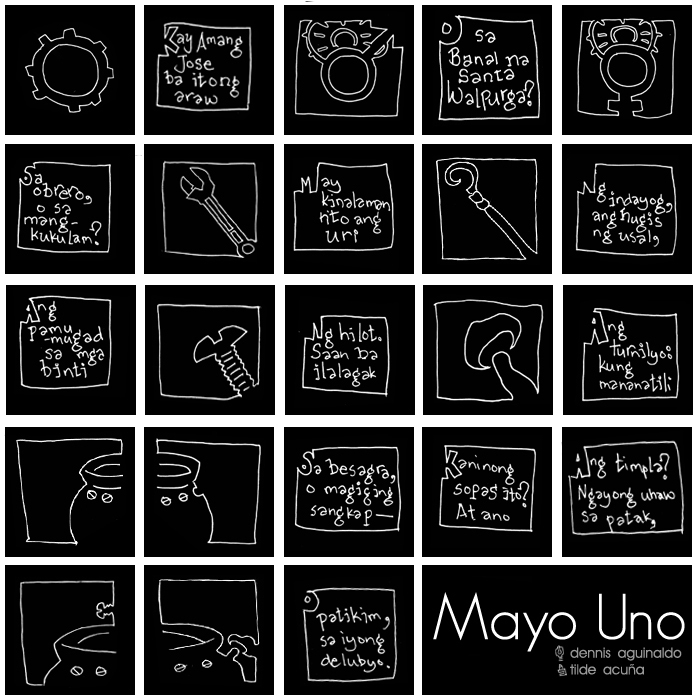 Bagamat nagsaliksik ako nang husto para mabuo ang tula hinggil sa kasaysayan ng a-uno ng Mayo (Faust, kheer aur shakkar, mayday! mayday!, Ephemeroptera, at Mabuting Ina ng Mais), hindi sumagi sa aking isipan (o siguro mas tama: hindi ko namalayang sumagi sa aking isipan) ang mga retablo ng Silang, Cavite. Ngayon ko lang ito naaalala gawa ng dibuho ni Tilde. At marahil ng iba pang mga bagay, mga anik-anik, mga lihim na kasangkapan.